Designed to provide the best possible experience for Major League Soccer fans, Avaya Stadium is among the world’s most technically and structurally advanced stadiums. When flying into the San Jose International Airport, you can’t help but notice Avaya Stadium. Home to the San Jose Earthquakes, the $100-million, 18,000-seat stadium on Coleman Ave. rose from the dust of a long-abandoned factory adjacent to the airport. Designed to deliver a premium experience to soccer fans, the stadium features a two-acre fan zone, a double-side video scoreboard, field-level suites and club seats, the largest outboard bar in North America, a canopy roof, and the steepest-raked seating in Major League Soccer. The stadium’s readiness for the Major League Soccer season home opener, which pitted the Earthquakes against the Los Angeles Galaxy on Feb. 28, 2015, is largely due to the extensive use of Building Information Modeling (BIM) throughout the project. Nowhere was BIM more critical to success than in the design and detailing of the structural steel and Sandwich Plate System (SPS) Terraces, the lightweight, sustainable alternative to concrete or stiffened-steel stadium terraces. Avaya Stadium, home of the San Jose Earthquakes Major League Soccer team, is among the world’s most technically and structurally advanced stadiums. Steel Systems Engineering (SSE) was tasked with providing shop drawings for the stadium’s structural steel. Selected in June 2013 by steel fabricator Schuff Steel Co., SSE (one of the three detailing firms involved) had recently completed its portion of the steel detailing for the new Levi’s Stadium in Santa Clara, Calif., home to the NFL’s San Francisco 49ers and host stadium for the 2016 Super Bowl 50. The firm was chosen for its stadium experience and expertise in BIM coordination, which would prove critical to completing the Avaya Stadium infrastructure within a compressed schedule. SSE worked closely with Schuff Steel and Intelligent Engineering (IE) in the designing, detailing and fabrication of the structural steel to ensure a perfect fit with IE’s patented SPS Terrace, which the owners chose over a traditional concrete or steel terrace. SPS is a composite-metal solution comprising two metal plates bonded with a polyurethane elastomer core, which transfers shear between each plate to eliminate the need for stiffeners and preclude local faceplate buckling. Introduced just a decade ago, SPS now is being used in a wide variety of applications, including stadium and arena terraces, bridges, ships and structural flooring. The complexity and unique geometry of the column connections are apparent in this image. On a typical project, two or three beams and braces might connect to a column; at Avaya Stadium, as many as nine beams and braces connect to them. SPS Terraces provide a lightweight, long-span, cantilevered bowl with minimal supporting columns. This design results in a better fan experience by allowing more of the audience to be closer to the field. When used as an alternative to precast concrete terraces, SPS Terraces provide an enhanced, non-slip finish and comparable performance at one quarter the weight. They’re also quieter than other steel terraces, with noise levels on par with concrete terraces, and can be reclaimed and recycled. Moreover, SPS Terraces are quick and easy to erect, because all structural connections use standard steel detailing, and fixture points for seats and other attachments can be pre-drilled in the factory. Construction programs typically are reduced by 15 percent, because three to four times more SPS Terraces can be lifted per hoist than precast concrete units, which also contributed to meeting the demanding Avaya Stadium project schedule. SSE started the steel infrastructure detailing in June 2013. The original schedule called for detailing approximately 2,900 tons of structural steel in 18 weeks. Partway into the project, the fabricator reduced the steel-detailing schedule to 14 weeks to make up for unrelated project delays. Working together, SSE and IE modeled the stadium, team building and scoreboard. SSE modeled and detailed for the WF & HSS columns, built-up plate girders WF beam framings, HSS & channel beams, raker beams, loose gusset plates, Terra Cotta supports, angles and WT & channel stool supports. IE provided engineering design and analysis, and modeled the bowl’s SPS plates and connections. Because the SPS plates lay over the structural steel, the match had to be exact. SSE, IE and Schuff Steel relied on BIM coordination to ensure the design and fabrication was correct the first time to prevent delays and added expense. Also complicating the steel-detailing process and compromising the schedule were constant design revisions, which had to be incorporated into the stadium model as they were issued. 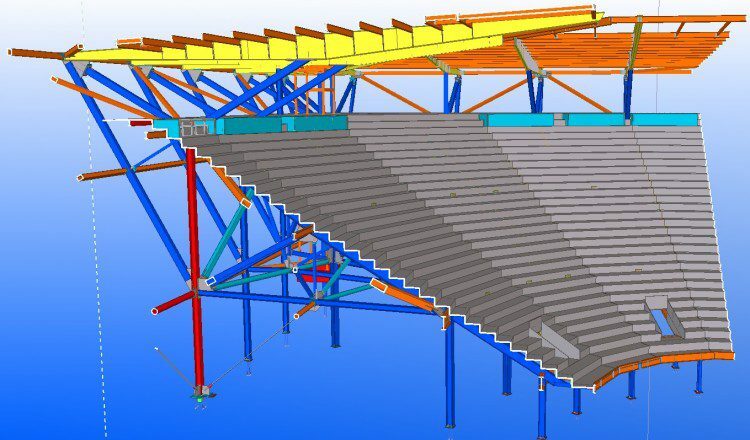 The Avaya Stadium models were created in Tekla Structures, a BIM software application especially suited to modeling steel and concrete infrastructure as well as construction execution. Each week, representatives from SSE in Sherman Oaks, Calif.; IE in Ottawa, Ontario, Canada, and Gerrards Cross, United Kingdom; and Schuff Steel in Stockton, Calif.; held an international GoToMeeting conference to go over the latest changes to the stadium model related to the structural steel, SPS plates and the connections. SSE imported IE’s IFC file to its Tekla model, then submitted it to Schuff Steel for use in the weekly GoToMeeting. When problems were detected, the team was able to discuss solutions, rather than going through a lengthy RFI process. Weekly meetings helped coordinate efforts through the model, and reduced RFIs by 35 percent over the course of the project’s structural-steel design and detailing phase. The model and meetings were instrumental in enabling the steel detailing to be completed within the compressed schedule. The tight BIM coordination ensured there were no problems at the point the SPS plates were being installed over the structural steel. BIM use was mandated by Devcon Construction, the general contractor for Avaya Stadium. Devcon required frequent updates in model status and required models in the form of IFC (Industry Foundation Classes) and 3D AutoCAD files. The general contractor is the true benefactor of BIM coordination. Being able to combine project models produced by other subcontractors, such as concrete, mechanical, electrical, plumbing and architectural, with the structural-steel model allows clashes to be identified and corrected in the model instead of at the jobsite during construction, where problems are expensive to fix in terms of time and money. 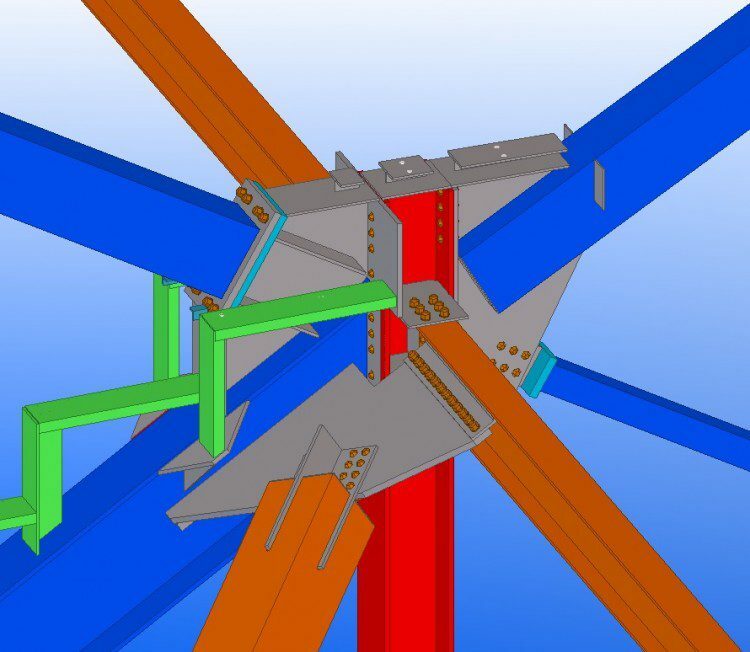 Schuff Steel mandated the use of Tekla Structures for the steel detailing for its ability to streamline the fabrication process, a requirement SSE was all too happy to comply with, having used the software since 2009. 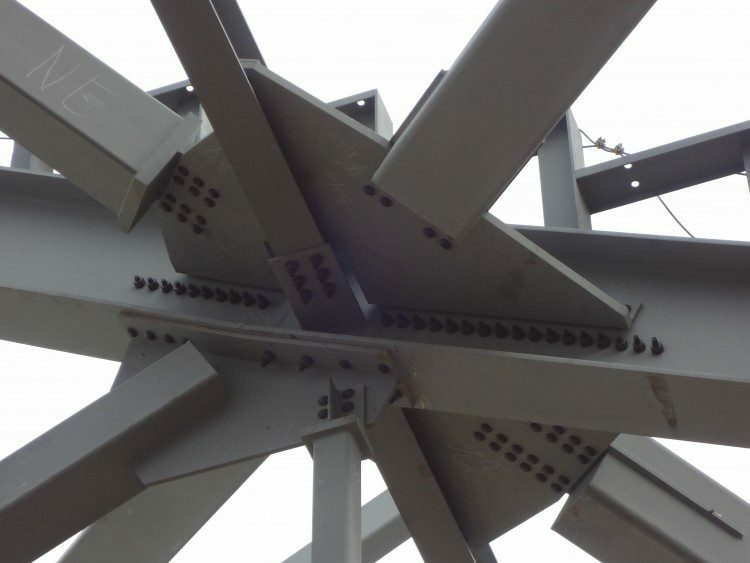 Tekla makes steel detailing easier, and it’s equally beneficial to fabricators. SSE was able to help Schuff Steel stay on track by generating an Advance Bill of Material (ABM) so the fabricator could order steel in the correct quantities for fabrication, while SSE was still working on the shop drawings. This allows Schuff to have the steel at the plant and ready to fabricate as soon as the drawings were delivered. Having this report early allowed Schuff to order the exact amount of steel required for the job at the best price for an ontime delivery, which was critical to getting the stadium built in time. The beauty of the cantilevered-bowl steel structure is apparent in these images. The minimal supporting columns create a better fan experience by allowing more of the audience to be closer to the field. For the fabricator, SSE produced 2,863 assembly drawings (6,862 members) and 3,904 part drawings (28,391 pieces) from the Tekla model. The accurate drawings were generated on time, despite the tight schedule and complicated connections, which added to the job’s challenge. Other challenges involved the unique geometry of the connections, including modeling brace-frame columns and raker beams with multiple, connected vertical braces. On a typical project, two or three beams and braces might connect to a column. The columns at Avaya Stadium have as many as nine beams and braces connecting to them. Being able to model in three dimensions made it much easier to detail the connections so they perfectly joined the beams and columns together. The team credits the weekly BIM coordination meetings with IE for ensuring the SPS plates perfectly matched the structural steel for installation. IE’s SPS unit model was exported in IFC file format and inserted as a reference for modeling the raker beams to match-fit with the SPS hole locations. The SPS plates also were difficult to coordinate, because they’re irregularly shaped and have many holes and bolts. One mismatch would have been very expensive, because the SPS plates are 1 1/8 inches thick. BIM was instrumental in making sure Avaya Stadium was finished on time, with the owner’s and architect’s design and performance intent intact. Likewise, collaboration and extensive coordination using project models scores points for ensuring Avaya Stadium’s innovative steel infrastructure was done right the first time. Edgar Echano is the Operations Manager, NSID Certified Senior Detailer Class I, for Steel Systems Engineering, with more than 15 years of experience in structural steel detailing; e-mail: edgare at sseus.com. Architect: 360-CA Schrock Architects P.C. Structural Steel Detailer: Steel Systems Engineering Inc.